At this year’s SPS IPC Drives trade fair in Nuremberg (November 27-29, 2018), the HARTING Technology Group will be showcasing numerous innovative connectivity products and solutions for smart and digital automation. Philip Harting, Chairman of the Board of the Technology Group, expressed his satisfaction with the recently concluded 2017/18 financial year (as at 30 September). “We once again grew at a double-digit rate. Growth came from all regions and sectors, but our business was given a strong push above all by mechanical engineering, automation and robotics,” Harting stated at the SPS press reception. Further details will be announced by the Technology Group at its annual press conference on December 7, 2018 in Espelkamp. The HARTING Technology Group offers products and solutions which meet the demands of customers and industries, as underscored impressively by the latest standardisation efforts. These saw HARTING successfully establish a new norm for miniaturised Ethernet interfaces on the market with its ix Industrial and IEC 61076-3-124. At SPS IPC Drives in Nuremberg, we will be using examples of real production and handling processes to demonstrate which specific solutions are needed, to e.g. depict holistic services such as predictive maintenance with Edge devices. Or, as well, the performance that new connectivity must have in the world of Integrated Industry. 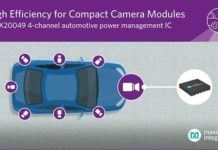 For example, in the automotive industry, IIoT and its ever smaller automation devices will pose new challenges to the requisite data infrastructure. These devices, e.g. proximity sensors or camera systems, must be quick and easy to install (Plug&Produce). Here, the operator strives for the best possible availability of the production system with the intention of keeping costs for installation and service as low as possible. However, the customer does not expect proprietary solutions, but rather market-compliant standards. With IEC 6107-3-125, HARTING takes another big step here down the road leading to the standardisation of Single Pair Ethernet. All relevant standardisation committees have now opted for the HARTING design of an SPE mating face. For the protocol, this is IEEE802.3, and for the cabling it is ISO/IEC JTC 1/SC 25 and TIA 42. HARTING’s active and successful standardisation efforts have thus also set the cornerstones and prerequisites for easier, IP-based Ethernet connection right down to individual sensors in the field of Single Pair Ethernet as well. The advantage for the user: space and weight savings while eliminating hitherto required gateways. At SPS IPC Drives, HARTING will use an example production process to demonstrate how advanced and powerful connectivity for transmitting data, power and signals simplifies the interaction between IIoT and automation. 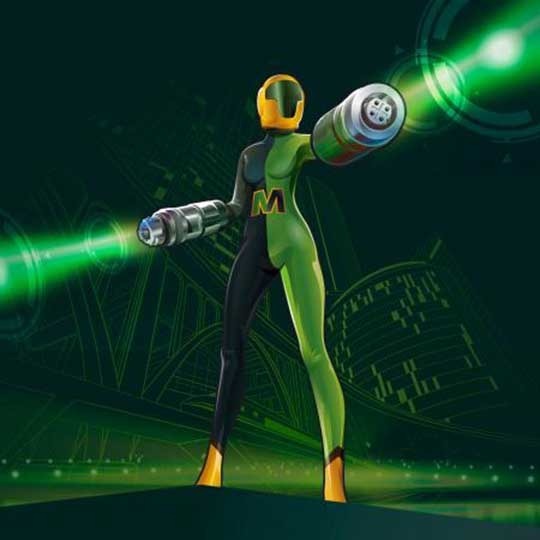 While “the little heroes” Captain ix, Tw1ster and MissM8ty have dedicated themselves to miniaturisation and the transmission of high data rates since 2016, Dr. Metrix brings additional strengths to the table. 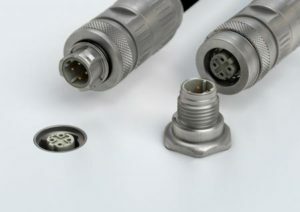 HARTING’s new heroine stands for clever PushPull technology on metric circular connectors and seconds-fast connection. Building block for easy-to-handle interfaces for energy chains: the Han-Modular Flexbox. The Han-Modular Flexbox makes it possible to divide energy chains in particular into flexibly manageable and easily replaceable segments. The modular housing concept replaces the previous implementation that features numerousindividual connections, and offers a single mating and disconnection point as a compact overall solution. This slashes the effort that goes into constructing connections, and less space is needed. The housings can be joined in different constellations by using connector elements. Both the height and width of the interface can be designed flexibly. The Han-Modular Flexbox thus fits the requirement profile of a broad array of applications. 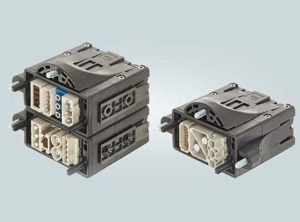 The Han-ModularFlexbox was developed in a co-engineering process with HARTING partner igus. One of the core requirements of flexible production is to quickly install machines and modules, retrofit them at any time and operate them without disruption. With the HanES Press HMC series, HARTING has developed suitable interfaces that can be installed quickly without tools and that are extremely robust – given the fact that they can withstand at least ten thousand mating cycles. The quick-connection technology goes by the name of Han ES Press HMC, with the suffix standing for High Mating Cycles. The Han ES Press series offers the additional advantage of outstanding resistance to vibration. This is due to how tight the conductor sits due to the constant pressure of the cage clamp. The advantage for the customer: installation and connection times are reduced in comparison to conventional cage clamps, screw connections and hard-wiring techniques.